Experience the History! Enjoy the sites of Philadelphia on board our authentic Victorian Style Trolleys. This popular Philadelphia Sightseeing Tour operates in conjunction with our Double Decker bus tour. Hop-on and off for 1, 2, or 3 Full Days! Step aboard one of our signature Victorian-style trolleys. Enjoy the view as the past meets the present through the colorful narrative of our experienced tour guides. 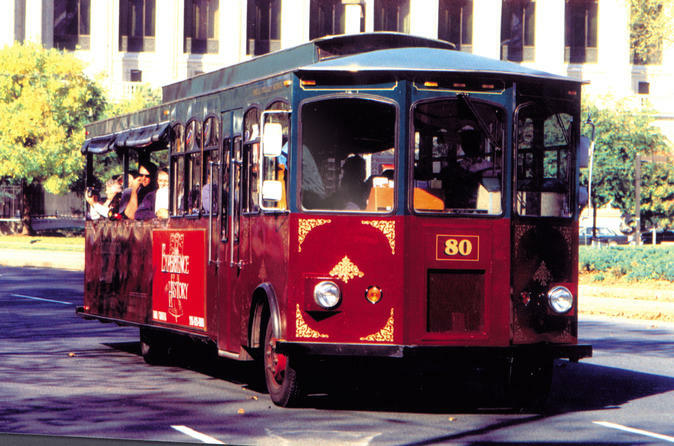 Trolley tours have frequent departures from the North East Corner of 5th and Market Streets. Our knowledgeable staff will enlighten and entertain you with humorous stories and fascinating facts about Philadelphia’s famous sights and attractions. Trolleys and Big Bus Double Decker vehicles operate interchangeably on the tour. Your pass is good for either vehicle. There are 27 different stops you can hop-on and off including: Independence Visitor Center- NE Corner of 5th & Market, Betsy Ross House, United States Mint/Ben Franklin's Grave, National Constitution Center, Chinatown, Reading Terminal Market/Convention Center Marriott/Macy's, City Hall/Love Park, Cathedral Basilica of Saints Peter & Paul/Sister Cities, Barnes Foundation, Rodin Museum, Eastern State Penitentiary, Perelman Building of Philadelphia Art Museum, The Philadelphia Zoo, Please Touch Museum/ Memorial Hall/Fairmount Park, "Rocky Steps" Philadelphia Museum of Art East Entrance, Philadelphia Museum of Art- West Entrance, Franklin Institute/Logan Circle, Embassy Suites Hotel, The Bellevue/Rittenhouse Square, Academy of Music/Broad Street, Antiques Row, South Street/Head House Square, Vietnam Veterans Memorial, Hilton Philadelphia at Penn's Landing/Columbus Boulevard/Spruce Street Harbor Park, Penn's Landing/Waterfront, Old City/Christ Church, and the Museum of American Jewish History. All tours terminate at 5th & Market/Liberty Bell. Seating on a first come first serve basis, All tours operate weather permitting.